I hear ya, Sis. It's not easy; it's hard. So hard, in fact, that I don't bother. If I did, I doubt very much that I would have something to write about. 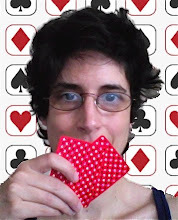 Seriously, I have been thinking about temperament in regards to playing poker, which may or may not have anything to do with emotional maturity.It may go back to that question you asked a few weeks ago: a writer (artistic) who plays poker or a poker player (strategic) who writes? I'm not so sure that both are always compatible, at least not for me.